U12 Blues (U13 next season) require a couple of players as they move from 9v9 to 11 aside football. Please contact manager Dean Leyland on 07710726340. All are very welcome to support this truly worthy cause. Please do your best if you are able to attend or send donations to https://uk.virginmoneygiving.com/nickbarnesmagician/1? 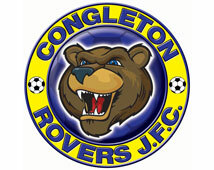 Please see our Facebook page, Congleton Rovers FC, for more boots and contact Helen Tang if interested. Funds are split 50/50 for the club and charity. A new photo has been published - click for bigger image. Early May Bank Holiday - Monday 6th May. Spring Bank Holiday - Monday 27th May. A massive thank you to Stormguard Floodplan for sponsoring the kit for our U9 Girls team. A big thank you to David Mitchell Electrical Services for sponsoring the U15 White team with their hoodies. A big thank you to the Waggon and Horses Clay Pigeon Shooting Ground for sponsoring the U15 White Team for the second time. Very proud of our little minis aged 4-6 along with our U9s who stood together in silence this morning. A huge thank you to BMSL for sponsoring the U12 Yellows this season with their new home kit. Congratulations to 11 year old Herbie James who has just signed for Manchester City. Herbie joined Rovers at U7s but was spotted and signed by Port Vale at U9. He has now been spotted by City and signed up. A massive thank you to Reliance Medical Congleton for their kind gesture of a first aid kit for all our teams this year. This is greatly appreciated. A reminder that all younger age group children must be collected from their training sessions in the 3G area.